Clayton Kershaw starts for the Dodgers in Game 1 of the NL Championship Series against Brewers left-hander Gio Gonzalez and — more notably — Milwaukee’s deep bullpen. Josh Hader and the rest of the club’s lights-out relievers have helped the Brewers win 11 straight games. The bullpen’s 3.47 ERA was second in the NL only to the Chicago Cubs, and it began to peak down the stretch. The relievers went 2-0 with a 1.17 ERA in the three-game Division Series sweep against Colorado. Gonzalez probably won’t need to go more than four or five innings before Hader and crew take over. Los Angeles‘ pitching approach will be more traditional. The Dodgers have gotten a higher percentage of outs from their starters this postseason than any other team, led by Kershaw’s eight innings of two-hit ball in a 3-0 Game 2 win over Atlanta. 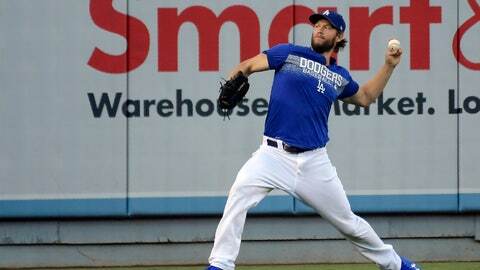 Kershaw has thrown 12 consecutive scoreless innings in the postseason dating to last year’s World Series. The Rangers have done their first interviews in the search to replace fired manager Jeff Banister. According to people familiar with the details, the Rangers on Thursday interviewed Chicago Cubs bench coach Brandon Hyde in Arlington, and did a phone interview with Astros bench coach Joe Espada because Houston is preparing for the start of the ALCS against Boston. The team is making no public comments about candidates being interviewed. Texas did its first interview Tuesday in Arlington with Jayce Tingler, the team’s assistant general manager. Giants bench coach Hensley “Bam Bam” Meulens has interviewed with the Reds for their open managerial position and also is set to meet with the Twins this week for the job that opened when Paul Molitor was fired. Meulens was in Minneapolis on Thursday and scheduled to interview with the Twins through Friday after traveling from Cincinnati. He met with the Reds, who fired Bryan Price after a 3-15 start. A former hitting coach with the Giants when they won World Series titles in 2010, ’12 and ’14, Meulens became bench coach this past season and Bruce Bochy’s right-hand man in his ninth season with the club. Adam Wainwright is staying with the Cardinals. St. Louis agreed to a one-year deal with the veteran right-hander Thursday, bringing him back to the only major league team he’s pitched for. The 37-year-old Wainwright has been with the club since making his big league debut in 2005. Wainwright made just eight starts this season because of hamstring and elbow problems, going 2-4 with a 4.46 ERA.